Three new auctions are up on our EcoEtsy Team blog this morning with more fabulous eco-friendly goodies. The proceeds from the auction this year are going to Habitat For Humanity's work in Japan. 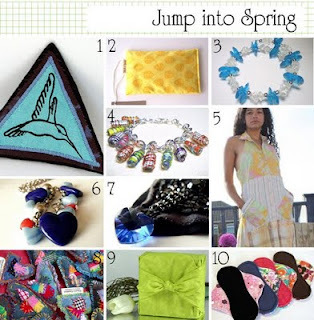 So let's recap...great handmade goodies that are easy on the environment AND they benefit charity? Perfect! Please check them out if you get a chance. Today will find me climbing Mount Washmore and engaging in other fun household duties, taking some photos of a few wearable vessels and (hopefully) putting them in my Etsy shop, then I'm hoping for some time at the saw. I found something spectacular this weekend...but I can't share quite yet. I hope your Monday is off to a good start. lovely lisa, the puddle jumping looks fun. of course we are experts here at puddle sports in portland, oregon. :) best wishes!! From rain comes mudpuddles into which jump happy children. Love the lifejacket. Way to leave us hanging about the spectacular find. i guess I'll just have to wait.